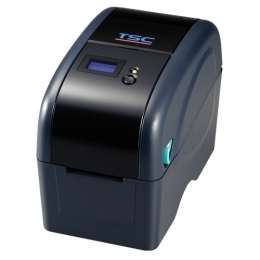 The ultra-compact TTP-225 Series of thermal transfer printers from TSC consists of two models for different print qualities. The TTP-225 prints labels and wristbands at 8 dots/mm 203 dpi at a speed of up to 127 mm/sec. The TTP-323 delivers the ideal quality for 2D barcodes, small font sizes or graphics with its 12 points/mm 300 dpi. Various media formats ensure for flexible and reliable usage in multiple areas of application. Max. media width 60 mm, max. print speed 127 mm/sec. The TTP-225 features a user-friendly clamshell design for simple media changes and smooth operation. Simply open the cover and drop your labels into the printers spring-loaded media tray. The optional LCD display presents important information about print job status. Because of its standard integrated industrial emulations such as EPL and ZPL the TTP-225 is compatible with nearly any other printer. Connect it via USB or optional Ethernet interface easily into the existing environment. With the optional keyboard, the TTP-225 also operates in stand-alone mode.